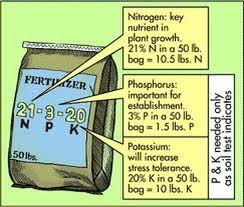 A bag of fertilizer is coded with the ratings of nitrogen (N), phosphorus (P) and potassium (K) that is contains, typically written in like 15-03-05 depending on how much of each macro-nutrient that specific bag contains. Each of these macro-nutrients is necessary for proper plant growth and this ratio is extremely important as it will tell how much of the product to put down based on the lawn size. This is by far considered the most important number when looking at the ratio. Nitrogen is good for that green color that everyone wants for their lawn as it promotes the growth of the leaves and part of chlorophyll, which is the green pigment of the plant responsible for photosynthesis. Too much nitrogen becomes a problem in the summer months for cool season grasses or for a lawn that is too dry. Applying too much causes stress, burn or death of the lawn. While phosphorus is an essential nutrient for plant growth, many lawns in the area such as Illinois, must rely on phosphorus that is naturally available in the soil due to a ban that was put in place in 2010. Too much phosphorus filtering into the water system is causing damage to animal, fish and aquatic life. Phosphorus is needed for the photosynthesis process similar to nitrogen and helps for oils and sugars as well as transfer solar energy to chemical energy. Phosphorus also helps with the plants growth and the growth of the root system. This macro-nutrient also helps plants withstand stress. Potassium is needed to build proteins within the plant as well as assist in the photosynthesis process. It also helps greatly with reducing disease within a lawn or plant. Understanding the fertilizer N-P-K rating and the importance of each macro-nutrient are an important step to having a lush, green lawn. Be sure to spread the fertilizer evenly across the lawn and spread only the amount that is needed for the specific lawn size to be sure that these nutrients are distributed and absorbed evenly.